Remember what your mom told you, “if you can’t say anything nice, don’t say anything at all”? Well, that is what I’m going to offer as an excuse for not writing more the latter half of this year. I write this not to garner pity or to complain (as much as it sounds like it), but to just tell you where I’ve been, and it hasn’t been a place where I felt like writing. 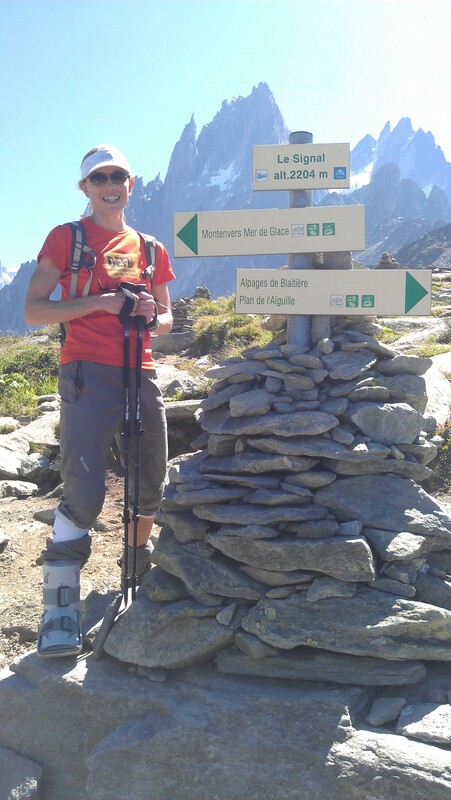 In July, right before my “dream” running vacation, I broke my foot (stress fracture, right 2nd metatarsal). What the @$%!!! was God thinking?!?! Just as I was about to come out of the aircast boot and start running again, I broke my back: ruptured and herniated lumbar discs! I was in so much pain I didn’t even THINK about running, let alone get out of bed. When I think about how this happened, I tend to throw myself into a pit where I tear myself to pieces before any lions ever will. Not that anyone really knows what happened, which is part of the problem. Again, the whole questioning God, angry, etc… I’m so glad God can take it! So, I haven’t been able to run since July and I don’t know when I’ll be able to start. The hard part is now that I’m not longer in pain (but I still have symptoms), and I feel like running, I still can’t. I must WAIT. ugh. You may be able to imagine just what this has done to/in/for me and I’m still dealing with it. No great wisdom or insight or lessons to share with you – at least not yet – only the mundane struggle of my mortality and not being able to do whatever I want to do! I guess I can say that I’m learning more about who I really am, but there is much more to it than that. If I ever get around to writing the book, I’m sure I’ll have something to share with you by then. Crewing at the Chiang Mai marathon (22 Dec) where I met a running buddy! In the meantime, I sought solace from other ultrarunners who have been injured lately. Ellie Greenwood discusses her injury and being “outta control”, a sentiment with which I identify, and she wrote a post about pool running that just about sums it up for me. This video about Anna Frost, her healing and comeback is beautiful and inspiring. I like the part where she says she is also discovering herself – her real self. On the upside, Relentless is going very well and I’ve been very busy! If you have been following (and I sincerely hope that you are, as that is where the action has been) that blog and Facebook page you’ll already know that. I suppose that is another excuse for not posting here more – it is difficult to maintain two blogs and several Facebook pages without some help on that! Books of 2013 Just because I’ve not been running as much, doesn’t necessarily mean I have more time to read, write, or other stuff. Even so, I’ve managed to eek out a few books this year – this is pretty much all I’ve read this year, so I try to make it quality. Novel – The Night Circus by Erin Morgenstern. This is the only novel I read this year, and I didn’t even “read” it – I listened to the audio CD whilst driving around during my Stateside trip. Non-fiction – The Rest of God by Mark Buchanan and Addiction and Grace by Gerald May. Both are transformative. Poetry – although not a specific book, I spent a lot of time with Gerard Manley Hopkins this year. I’m currently in the middle of Centering Prayer by Cynthia Bourgeault and the book gets better the further I delve into it so I can give a not-too-premature recommendation for it. Let me leave you with this quotation I recently saw on a friend’s wall. I have no idea to whom to give credit, but it is brilliant, and something to ponder well after Christmas has past. If as Herod we fill our lives with things and again with things. If we consider ourselves so unimportant that we must fill every moment of our lives with action when will we have time to make the long slow journey across the desert as did the Magi? Or sit and watch the stars as did the shepherds or brood over the coming of the child as did Mary? For each one of us there is a desert to travel, a star to discover, and a being within ourselves to bring to life. Categories: reflections | Tags: Chiang Mai Marathon, running | Permalink. It’s hard to believe that we’re well into March already! February was a very full but fabulous month as it was the every-two-year Continuing Medical Education (CME) meeting for health professionals working in cross-cultural health settings across Asia. The conference is designed for North American (because we tend to have stricter requirements) health professionals who need valuable CME to maintain their practice license. It is of course a full schedule of medical lectures (all optional), but it is much more than straight medical lectures. Workshops in reading ECGs, “ultrasound for dummies”, and use of other techniques and modalities to help those of us working in areas where there is no other specialty consult service (such as when I was working at Kwai River Christian Hospital). The faculty who come take their own time and spend their own money to come and teach us. THANK YOU! However, it is even MORE than a medical conference! Every two years I get to spend a couple of weeks with friends from all over the world learning, worshiping, crying, laughing, and enjoying each other. These people are truly my peers and it is so refreshing to come together again. Many of us will drag ourselves in haggard and weary – barely hanging on until we can get to Chiang Mai (location of the meeting since 2001). The week is tiring enough, but it is a break from our normal schedules and routines. Although I left quite exhausted – having maxed out my capacity for people interaction several times over – I was also thoroughly refreshed. Therefore, I want to encourage all of you who support cross-cultural medical workers to support them financially to attend meetings such as this one. It is important professionally, of course. But I know it is also a lifeline for many of us and it is a component of “member care” that enables us to go back and keep going in our work abroad. It is a break for health care professionals AND their families (many are 2-profession families). Another thing to consider in support of your worker is to come and serve as a child care worker at similar conferences. Not a “glamorous” short term mission, but an absolutely essential one! If you are a member of CMDA (Christian Medical Dental Association), consider contributing towards this very valuable medical missions endeavor – your sponsorship helps keep the costs down for us. My birthday was last week and of course I had to celebrate with a special run! 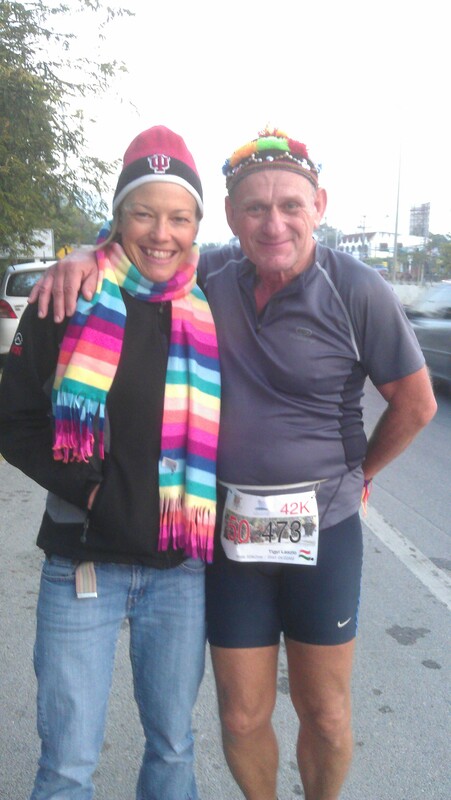 The marathon distance is basically 42km (26.2 miles) and so I had a birthday marathon to celebrate 42 years! Three running buddies showed up for coffee before heading out at the 6am start time. Two ran the first 10km loop, but then had to get off to work. The third gutted it out to the last. He is fit, but I had the special birthday adrenaline and just could not slow down… until he asked if we could walk. <WALK!? !> To his credit, we actually went 44.6km because I found a new trail and didn’t want to turn back so soon. The only thing pulling me back was that I had another (non-running) friend coming to my house to make pancakes for my post-run treat! Besides, I had to be back, cleaned up and fed before my scheduled massage! That evening I spent with another couple of friends at my favorite live music hangout place. It is just a few weeks until Easter. I don’t know what traditions you follow for the Lenten season – I actually never really heard of Lent, or thought it was something for me until I was older – but I like to read one of two books to be mindful of the season. This year it is Henri Nouwen’s “Show Me The Way” that takes one through every day of Lent. Nouwen has always been a sort of pastor to me. I know that you will also be enriched from his writing as well. What kinds of practices do you follow for the season, if any? Categories: expat life, medical | Tags: Chiang Mai Marathon, CMDA, expat life, Henri Nouwen, medical training, running | Permalink. I hope that this finds your new year a happy one so far! Although I want to jump ahead and start discussing this year, I still have some unfinished business to write about 2012. RELENTLESS After returning from the States in November, I dove into deep water preparing a series of workshops on child abuse and neglect for residents at Chiang Mai University School of Medicine. Please see this post on the Relentless weblog for more about that. Another few days in Bangkok in December saw some partnerships down there solidly come together. The heavy cotton skirt got pretty hot, and I had constant wardrobe malfunctions, but it was a lot of fun. All the smiles were worth it! RUNNING The Chiang Mai Marathon was held on 23 December. Due to some injuries and health issues, my training had not been what I had hoped it would be so I thought of a way to take the pressure off myself and not take myself too seriously: run in costume! A friend of mine had the perfect idea to run as a Thai school girl! I called a colleague who works in a children’s home and asked if I could borrow one of the girl’s uniforms. Perfect! It was immediately culturally recognizable, and very perplexing (and funny!) 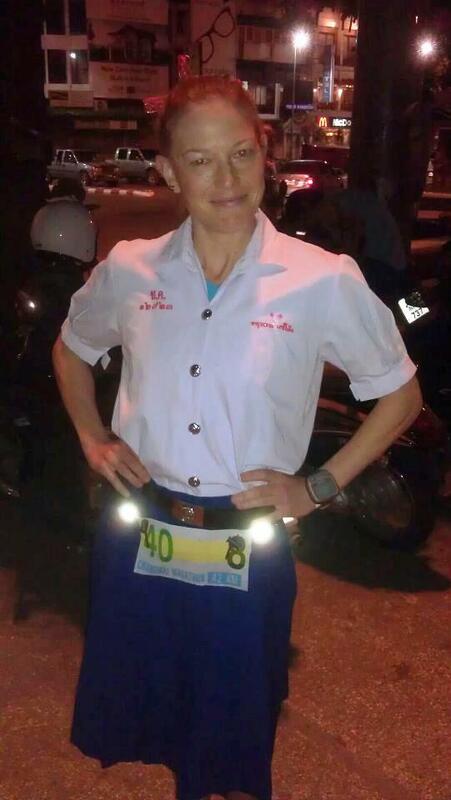 that a farang woman would be running in such an outfit! I still did OK – good enough for 3rd place in my age group which gave me an extra $100 towards my vacation fund. URBANA The workshop series took me right up to 24 December and on Christmas evening I boarded a plane to speak at Urbana. The conference, for the first time, had an emphasis on health care ministries and I was honored to be invited to speak on human trafficking, orphans and vulnerable children, as well as sit on a panel of cross-cultural health care workers. The talks went well and I was talking with students for an hour after each session! Otherwise, I stayed pretty busy with my own work, networking, and meetings – Urbana is a great place for that! HOLIDAY After Urbana, I made an 8-day lay-over in LA where I stayed with friends in Santa Monica, CA. It was my first true holiday since attending Breathe in 2010! I ran on the beach and in the mountains every day (a total of 101 miles)! I saw movies, went to art galleries, and basically didn’t use my brain for the entire break! BOOKS I can’t let 2012 go without mentioning some of the best books I read last year and making these recommendations to you! Escape from Camp 14 by Blaine Harden is another gripping true story of the only person born in a North Korean labor camp known to have successfully escaped. The novel of the year for me (perhaps the only novel I read) was Byzantium by Steven Lawhead. Not a new book, but if you haven’t read it you are missing out. Other notables include The Other Side of Normal by Jordan Smoller (psychology) and Waterlogged by Timothy Noakes, MD (endurance hydration). There is, of course, much more to say and reflect upon between these sterile lines of text. There is more I’d like to share with you. Unfortunately, by the end of the year my margin got totally eaten away by a number of things outside my control (and a few things within it). Now I’m trying to re-establish a better rhythm of life for this year. However, just catching up from a week of vacation can be enough to cause burn out! I’ll not let this happen. Categories: reflections, Relentless | Tags: Chiang Mai Marathon, medical training, Relentless, thai doctors | Permalink. It’s a New Year – Surprise Me! So, surprise me God! Your surprises are so much more rich and blessed than what I could think of! Of course I would never think of or hope for anything adverse or contrary to my goals would happen to me, but that doesn’t mean that these unbidden events are necessarily bad (although it certainly feels like it!). What I can know is that each event is not a surprise to God, and I pray for the grace to accept each one as an opportunity to grow. This was a good word for me to start out the new year 2012. The year 2011 was full of surprises (I moved back to Thailand for one) and I have no doubt that 2012 will bring many new joys and I’m very much looking forward to seeing how it unfolds – there is a lot up in the air even now as I write. I hope you are full of anticipation as well! I had intended to take a couple of rest days in the final week of 2011 to journal, read, reflect, and blog. What happened was that I just plain rested. It seems that 2011 and all that I did last year caught up with me and I found myself exhausted. It was all I could do to wind down so that by Friday I felt pretty good again. Although I had a few items of work to follow up, I did no heavy reading, made little use of my brain, and I certainly had no desire to sit at the computer for any length of time trying to make sense of the year through the fog of my fatigue. So, no big revelation that wraps up 2011 for me, and that’s OK. I did so much last year I don’t think that’s possible. However, I did I manage to finish off a couple of novels I had going – Byzantium and The Guernsey Literary and Potato Peel Pie Society (great books, both); saw two movies in the theater; and let myself sleep as long as I wanted. Of course I still managed 74 miles of running! Speaking of running, I completed the Chiang Mai Marathon in 3:45. I was just hanging out, chatting with a friend from Kunming (surprise!) and others and running pretty conservatively as I didn’t really know what I could do since I was training through this event and didn’t taper or anything. At the half, I was feeling really good and started to pick up the pace. The hilarious thing was that this time was good for second in my age group and 4th female overall and I even got 4000 Baht ($130) as prize money! The stink of it is that I lost first by less than a minute! I had no idea! Sorry, no pics – had I known that I was going to be able to park my moto within 100 meters of the start/finish I would have brought my camera – who knew! Categories: reflections | Tags: Bread for the Journey, Chiang Mai Marathon, Henri Nouwen, New Year | Permalink.